We recently had the opportunity to catch up with Helen, one of the co-owners of the recently opened Korean Food Stories restaurant in Prenzlauer Berg. She shared with us her story, her inspiration and her take on Korean food. Check out the full interview below. W8H: First of all, how did you end up in Berlin? You have mentioned that you have experience in the restaurant business already – how much different was opening your own venue in Berlin compared to the experience you had before? When I was younger, I worked over 7 years in the restaurant business at the front of the house – waitress, bartender, hostess, etc. I never (at that time) worked back of house in the kitchen, but I was constantly spending my time cooking, experimenting, eating out, testing. I’ve travelled quite a bit in Latin America, North America, Asia (also lived in Korea) and Europe – so I’ve picked up a little bit of this and that from various international cuisines. For example, I use a bit of my homemade Indian spice rub in some of my meat marinades to give it an extra kick (my secret ingredient). I also worked cooking for 8 months in a Korean restaurant in Berlin. But most important, I grew up helping and watching my parents with their two food businesses (in Canada) – Sun Foods and Helen’s Natural Foods. For almost 20 years, we produced Korean (Kimchi) pancakes, sauces and Korean dumplings. I remember many nights and days, chopping green onions, packing pancakes or helping my dad wash hundreds of kilos of Napa cabbage for kimchi making. I cut a LOT of cabbage in my life. Berlin seems to be experiencing a peak of interest toward Korea – Korean restaurants and pop-ups are frequent and very popular. What do you think is the reason for this interest? How do you experience this – is it a competition threat, or a new opportunity that is backed up by public interest? The interest for Korean food is not just in Berlin…it’s taking the world. I’ve seen Kimchi on non-Korean restaurant menus from London ramen houses to New York delis. Korean food is very bold, very unique and super healthy. Berliners are always conscious and curious in finding healthier food options, loaded with nutrition. But Berliners also don’t want to eat boring rabbit food. Korean food is spicy and certainly not shy on strong flavours – garlic, ginger, chili “The Holy Trinity.” And, it definitely fills you up and energizes you, as opposed to making you feel heavy and tired. There’s also a huge trend and focus on the health benefits of fermented foods – and Korean cuisine is loaded with naturally fermented foods. There are over 200 kinds of Kimchis alone! I strongly believe that Korean food isn’t going to be a trend, but will integrate as “everyday” food, just as other Asian cuisines have. My theory is : the more Korean restaurants that open up, the better. It just means more overall exposure and awareness of the great flavours of Korea. It would be great to hear about the concept too – you have mentioned you want to have as much a “home” feel as possible – why? Who are your dream customers and what is the perfect future of Korean Food Stories for you? The concept is homemade food, so the place has to feel like home too. Korean Food Stories is my home kitchen….and the guests who eat there are getting a taste of what I’d normally cook at home. Sit back, relax and enjoy. Our place is a no-nonsense, casual place. The perfect customer is curious and open minded. Even after only 3 weeks of being open, I have regular customers who come in 2-3 times a week – trying the weekly menu or something new each visit. I have a weekly changing menu that I put up, including my favourite dishes from childhood or that I remember my mom making for me or a fusion of flavours from different cultures. It’s sometimes dishes you wouldn’t normally find on a typical Korean restaurant menu – but more what you’d find if you were invited for dinner at a Korean home. I hope in the summer to offer more outdoor meat grilling type of foods on our terrace, and expand the menu. And everything is available in vegan/vegetarian. We even offer vegan kimchi. And all the housemade kimchi is available To-Go in a jar. 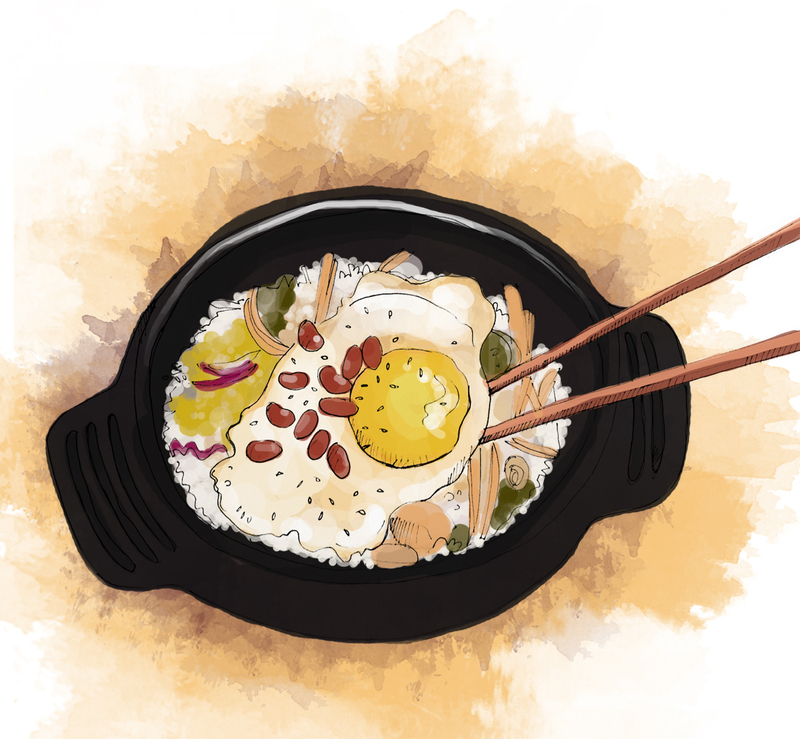 From my first visit, I remember being amazed that the Bibimbowls were cooked fresh and served steaming hot, and all the ingredients tasted fresh and distinct – which is often not the case in places where bibimbap has only one taste – spicy. What is your pro-tip on that? I’m VERY VERY happy you noticed this small, but important detail!!!! As I mentioned, Korean food is healthy, but it can quickly become unhealthy. A lot of the bottled sauces (used almost always in Korean dishes) – like Gochujang chili paste (for Bibimbap) or soup bases – are loaded with Glutumate and Corn Syrup!!! This is not our concept. Everything we make is natural and homemade. So, for example, I make my own Gochujang chilli sauce to avoid any of these unhealthy ingredients. A bit more work for me – BUT… this allows me not only to control salt levels and sugar levels… it also allows me to control the SPICY level. And THIS, is why my Bibimbap isn’t crazy spicy. My sauce is homemade. I leave extra chili paste sauce on the tables for anyone who wants to make it spicier. But my concept is that you can always add heat, but you can never remove it. So I add a little, but better let each person adjust to their own taste. My second concept is “let the vegetables shine”. Traditionally (and 99.9% of the time), each vegetable in a Bibimbap is separately fried/seasoned in oil, then added to the bowl. But I love the flavour and crunch of vegetables…and my concept is also to keep things as healthy as possible and avoid unnecessary use of oil. There is so little oil in our food, except for mainly 100% sesame oil. So – if the vegetables are cut finely enough, and the bowl is sizzling hot, then the vegetables will lightly cook in the bowl, but you will still get the flavours of each vegetable. I give the vegetables a light marinade without oil – so the finishing taste is fresh and light. I have customers that come in 2-3 times per week, and they do so because they know that the food is healthy and is something they can eat often. In my meat marinades, I use natural sugars from fruit juices to make and tenderize the beef and chicken. There is a tiny amount of natural wheat in soy sauce for fermenting purposes, and aside from that, the menu is virtually gluten free also. I am sure there is more you can mention, and I will be very happy to share as much about Korean Food Stories with our readers as possible. I just want to say…the questions that you asked and things you observed in your short visit – were bang on. I’m happy our concept is shining through, but also you must have a very keen eye! Another Korean restaurant, ShikGoo on Tegeler Str. in Wedding, is one of my long time favourites in Berlin. Your interview really makes me want to test Korean Food stories too, and maybe add it to my favs. Great! We really hope you will love it!